Image courtesy of Manly-Warringah Wolves Media. Holly Graham, Jessica Joslyn and Rachael Lewis will make history this weekend when they all line up for their 50th AFL game. The three Manly-Warringah Wolves players will reach the milestone against the North Shore Bombers at Weldon Oval on Saturday morning. Graham, Joslyn and Lewis are the first three female players at the club to reach 50 games, all having been a part of the side since the inaugural Women’s Wolves team entered the competition in 2014. Graham and Joslyn have co-captained the side since 2014 and have played an important part in the team’s success. Holly is often named as one of the best on ground, while Jessica has an unteachable knowledge and intelligence for the game. “I started playing AFL in 2013 after seeing a flyer about it at Uni,” Graham said. “Being an AFL fan all my life but never having a girls team on the beaches meant I jumped at this straight away. Similarly, Joslyn wanted to give AFL a go because it looked like an exciting opportunity to learn something new. “I quickly became addicted to the sport because it felt like it had an extra dimension to anything I had played before,” Joslyn said. Lewis has made a name for herself with the way she punches above her weight. She has lightning speed and is not afraid to tackle players even twice her size. “I have loved the challenges that AFL has thrown at me, and the different skills that I have developed,” Lewis said. “AFL is a game for all different shapes and sizes. Being someone small in stature I have been able to prove to myself, and others, that no matter what your size is, you can go out on the footy field, give it your all, and be successful. 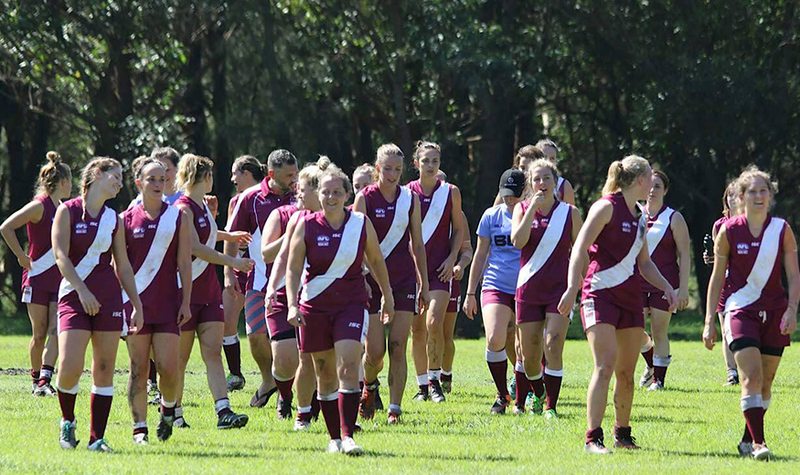 Alisa Kelley, Head of Women’s Football at the Manly-Warringah Wolves, believes these milestones show the growth of Women’s AFL in the area. “The club has come from being initially somewhat bemused by the team, to seeing the Lady Wolves as a force to be reckoned with – both on and off the field,” Kelley said. “We are in the fortunate position of having a rapidly growing Youth Girls presence on the beaches, with Pittwater, Forest, Manly and Balgowlah all fielding all-female teams. “There is now a pathway for girls from Auskick to seniors, and our ambition is to be able to field a Premier Division team in 2018. The Manly-Warringah Wolves take on the North Shore Bombers at Weldon Oval on Saturday, 1 July 2017 at 9.30am. If you want to get involved with Women’s AFL, please visit the the Play AFL website.